Monday was a terrible day in the stock market. The S&P 500 had a new closing low for the year. It briefly touched a new intraday low. In my book, this is a bear market, despite the media nonsense that it's only a bear market if it's down 20%. By the time the market averages are down that much, many mutual funds and individual stocks will be down more. Would you want to sit through that? I hope that you followed my advice earlier in the year and took your money home and let it hug you while everyone else was feeling the pain. If you have, great! I'd accept these gifts gratefully and take advantage to lighten up big time. Bear markets typically last 18 to 30 months, and this one is just starting. I see no reason why it might be more benign than is typical. Along with my suggestions on what to do about it, here are some of the reasons why I think the markets are still headed lower for a long time. They relate not just to the Fed taking money out of the banking system every month, which we have talked about a lot over the past year. They also have to do with a yawning, and still widening, federal budget deficit. The U.S. Treasury is kind enough to keep us up to date on that every day with its Daily Treasury Statement (DTS), released one day after the fact. That's real-time data on the state of the U.S. economy. Then once a month, usually on the 12th or 13th, it reports the Monthly Treasury Statement (MTS). The MTS ties up a few loose ends from the DTS and breaks down a few categories of tax collections into more granular data that is highly revealing. This includes details on Social Security taxes and excise taxes that are not available in the DTS. I give you a peek at that data here, and I report on it in depth in my Wall Street Examiner Federal Revenues reports. Back in October, I wrote, "Businesspeople take their cues from the stock market. When stocks collapse, both real investment and the broader economy will follow. Part of the reason that the stock market will collapse (OK, I need to amend that to "is collapsing") is that the tax cut has sharply cut revenues. That money must be borrowed via increased Treasury issuance. With the Fed pulling money out of the market, that new supply of Treasury debt can't be digested by the market without something being liquidated. That something is stocks and bonds." You can see the impact of the tax cuts and increased federal spending in these charts. The deficit has been gradually widening since January 2016. The tax cut and 2018 budget agreement spending have exacerbated the trend. [URGENT] $25 billion in unpaid benefits could be disbursed – are you owed money? This was entirely predictable and predicted. Even a couple of government agencies predicted it. Back in April, I reported that the Congressional Joint Committee on Taxation (JCT) forecast that the tax cut would add $280 billion to the deficit in 2018. Then in September, I reported that the JCT and Congressional Budget Office (CBO) were projecting an average $100 billion per month deficit as far as the eye could see. Even the White House Budget Office agreed. 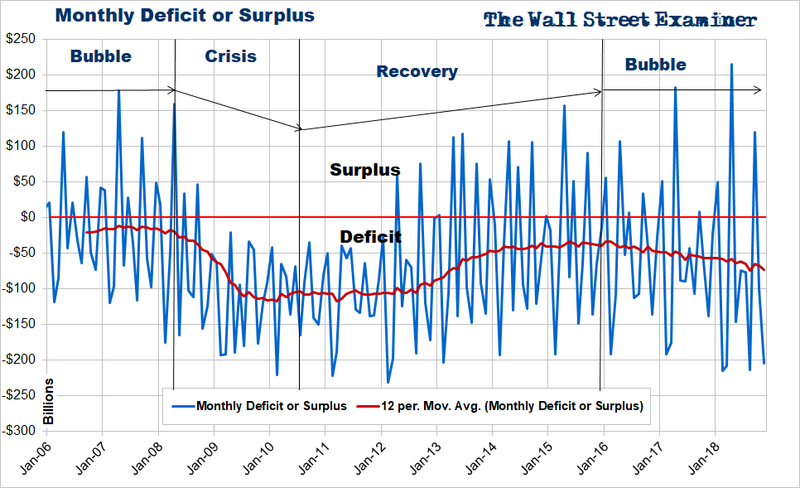 I wrote back in April, "This increase in the deficit will cause an increase in an already heavy Treasury supply forecast, which will pressure all markets." In addition, I reported back then, "Particularly shocking is that the CBO projects that revenue losses due to the tax cut will continue until 2026. 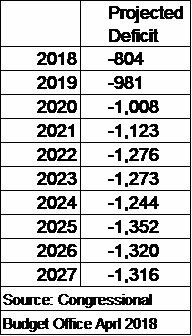 Here are the CBO's projected deficits for the next 10 years. It projects increasing deficits and thus increases in Treasury supply for the next eight years. "The news is worse than that. The deficit for 2019 is already on track to be a couple hundred billion higher than the CBO projected. The government must fund that by borrowing money in the market in the form of long-term bonds, medium-term notes, and short-term bills. Remember, in the bad old days of Quantitative Easing (QE), the Fed printed and pumped enough money into Primary Dealer accounts to fund every dollar of new Treasury supply. Today, they're not only funding zero new supply, they're actually taking money out of the system and forcing the Treasury to borrow even more, to raise the cash to pay off the paper that the Fed is redeeming. 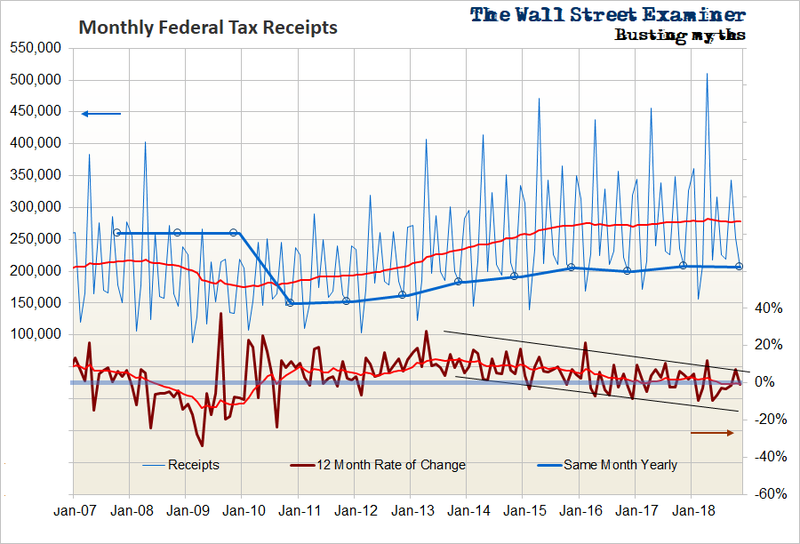 With the tax cut, the year-over-year change in federal tax receipts is now averaging only zero, as shown by the 12-month moving average (red line) on the rate of change indicator. The idea that cutting taxes increases revenues is false, so this is no surprise. There's no sign of improving momentum either. 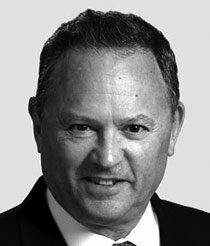 There's no sign that the tax cuts will stimulate enough growth to generate an increase in revenue. In February, I warned that, "With the tax cut acting as economic stimulus, economic data will probably strengthen over the next several months at least. That should make the Fed even more determined to stay the course of tightening." That has happened.